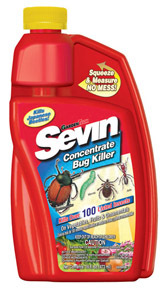 Sevin bug killer concentrate eradicates more than 100 insects on vegetables, fruits, and ornamentals. Seven Concentrate is for outdoor residential use. Would you like to see the Sevin Concentrate Pint Label? Would you like to see the Sevin Concentrate Quart Label? How about the Sevin Concentrate MSDS sheet?